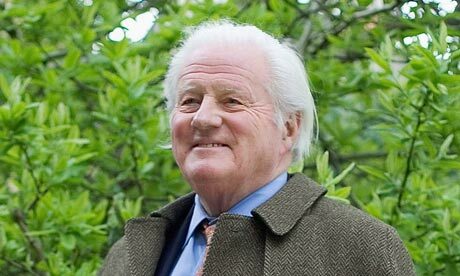 None who attended the talk by John Julius Norwich on Tuesday were disappointed, as he gave a wonderfully warm and personal tribute to Paddy. One Greek lady praised John Julius so highly for his talk and his work as a Byzantine historian that she described him as “the loveliest man living”! Apart from a few hearing difficulties there was little to indicate that age had slowed John Julius. His voice was strong and his recall of the times he spent with Paddy and Joan was vivid. He quoted a lot from letters between Paddy and his mother, Diana Cooper, to emphasise the range and scale of Paddy’s intellect. This was no hurriedly put together speech. Reading from prepared notes, it was clear that John Julius had planned the talk in detail and kept to his subject clearly answering the question “what was Paddy’s world?”. It appears that the answer was Europe, in particular, its more easterly reaches, with Greece, and the lost past of Byzantium of course, at its centre. Paddy rarely travelled beyond its boundaries, the same boundaries that I often describe as the widest extent of the Roman Empire. He travelled only once to South America, recalled in his Three Letters from the Andes, and visited North America on a single occasion at the invitation of the Greek diaspora. Apart from his wartime experience he never ventured into the Levant. Paddy’s world was the one that he had walked through in 1934, but one that he mastered by speaking all of the main languages and developing an encyclopaedic knowledge of its history and customs. John Julius ended on a very personal note, and holding back some tears, he said that he was blessed to have known Paddy and clearly misses him. During questions he described Paddy as the least self-centred of men, rarely talking about himself, happier to entertain people with his stories and singing, and only talking about the Kreipe kidnap when pushed into a corner. We can probably recognise this Paddy; despite extensive writing we know little of his personal thoughts. Apart from his introductory letters to Xan Fielding, John Julius said that Paddy never spoke about his life before his “great trudge”. Thank you to John Julius Norwich for a wonderful presentation, and to the PLF Society for organising a very successful evening. This entry was posted in Paddy's Friends and tagged John Julius Norwich, Patrick Leigh Fermor, Patrick Leigh Fermor Society on November 12, 2015 by proverbs6to10. Interesting to read that Paddy didn’t wish to speak about himself. When reading from Artemis Cooper and other sources, I have read Paddy seemed to be happy as the centre of attention when regaling tales and adventures of his past. Indeed, as I can recall from reading Lawrence Durrell in the book “Bitter Lemons” , that when in Cyprus, Paddy sang loudly, so as to be heard in Greek songs (during the time of Enosis) and on occasion when the time arose would make himself very loud singing his loyalties to the Greeks. I don’t believe he was shy and don’t accept he was the retiring type that wouldn’t talk of himself. I do happen to know someone who knew him and I know I am correct in this small matter.